Rescue and Combat ID Markers - Lightweight, durable, ecologically friendly, battery powered chem-light replacement tool. When you employ a Glo-Wand you immediately feel the difference. Lightweight, durable, ecologically friendly, battery powered chem-light replacement tool. When you employ a Glo-Wand you immediately feel the difference. Due to it's long-life battery, fewer are needed, lightening your ruck on long patrols. When employed as a directional tool, it's lightweight is immediately obvious, as D-cell flashlights can weigh as much as twelve Glo-Wands. The Glo-Wand is available in single or a dual-end ( Two-Color ) system in 4inch, 6 inch or 12 inch lengths. Unlike chem-sticks, the user decides when to turn the Glo-Wand Off. 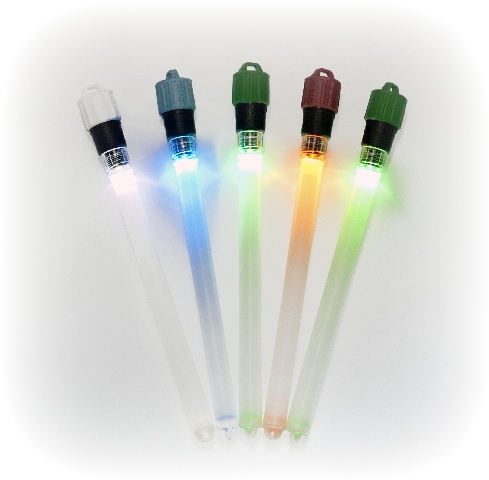 By replacing the chem-stick with reusable Glo-Wands this can add up to a significant cost savings at the end of the year. Glo-Wand offers numerous colors to choose from including IR. Slip 2 or 3 Glo-Wands into your MOLLE, or tie one down thru the molded attachment points. The MK Glo-wand is water resistant to 150 feet. Color end caps indicate LED color. The IR Glo-Wand when tossed into an unsecured room during clearing operations while on NVG/NOD is a safe hands free illuminator, allowing the individual team member to keep his IR illuminator off. Whether you currently use chem-sticks to read maps, mark obstructions, pot-holes, turning points, vehicles, or personnel; the Glo-Wand is an excellent, reusable, economically sound, ecologically friendly, alternative. Available in a variety of Light Output Colors. First, select a One or Two Color Product below. Then, on the next screen you will be able to select your specific color options.